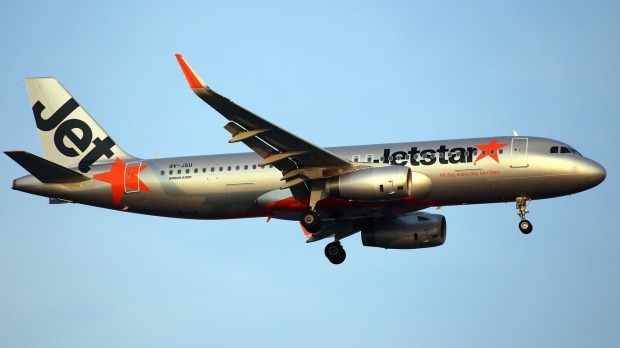 Cheap but not so cheery: Jetstar has attracted some criticism over its cabin baggage limits and new Melbourne terminal. Do you buy the cheapest, factory-second fridge and express dismay and disgust when the insulation seal falls off? Are you surprised when the home-brand ice cream doesn't taste like the $5-per-scoop salted caramel from the artisanal gelateria with the queue out the door? So why is it that when they buy the cheapest ticket on a low cost carrier, airline passengers are shocked and distressed when they are shunted to a no-seat terminal, when they get whacked with excess baggage fees and zero inflight service? Because – reality check – that's what you paid for, and that's the way it is with budget airlines. They're lean and they're mighty, mighty mean and they're also successful. Here's a fact that might surprise you. Which airline carries more international passengers than any other? Delta, American Airlines, Lufthansa? 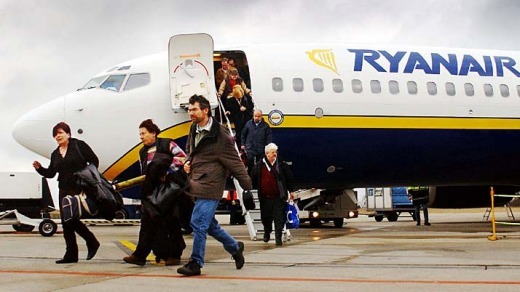 Answer: Ryanair​, the airline flyers love to hate. The airline that wanted to charge passengers for using the toilet. In 2014 Ryanair toted​ 86.4 million passengers across borders, 30 million more than the silver medallist, fellow budget carrier easyJet​. Low-cost carriers have been around since the 1960s but it was not until the 1980s that the phenomenon took off in earnest. It was in that decade American Airlines concluded that three-quarters of its passengers were not eating the olive that came with their dinner salad so they cut out the olive – and saved $40,000 in just one year. The airline also concluded that it lost not one single passenger as a result. To keen-eyed would-be competitors within the airline industry it was a light bulb moment. If they could take out the frills they could offer a cut-price service and take on the majors. Ever since, budget carriers have been scrambling to find new and ingenious ways to cut way beyond the olive. It is partly due to their efforts and their ingenuity that air fares are the bargain price they are today. Here are 10 strategies budget carriers use to shave costs, and deliver cheaper fares. Fuel accounts for a third of an airline's costs and every shed kilogram cuts $100 from an aircraft's annual fuel bill. French charter airline Air Mediterranee, has recently fitted its Airbus A321 aircraft with skinny Expliseat seats made from titanium and carbon fibre that weigh just 3.9 kilograms, eight less than the popular Recaro​ seat. Low-cost Indian carrier GoAir employs only female flight attendants, since they average out at 10-15 kilograms lighter than males. Four years ago Ryanair announced plans to print its inflight magazine – which doubles as its inflight menu – on thinner paper. And if you think you're going to sneak on board wearing two pairs of trousers, a couple of coats and carrying 15 kilograms of cabin luggage you're on the train to pain. Are we sitting uncomfortably? Packing in more passengers is the name of the budget carrier game. Due to enter service in 2017, the new Boeing 737 MAX 200 will feature petite toilets with one wall of the cubicle curved to accommodate more seats. Ryanair has ordered 100. US budget carrier Spirit Airlines has set a new low bar for seat pitch, trimming its standard-economy seats to 71 centimetres, just slightly over 28 inches. Shrinking the seatback pocket and placing tray stowage higher on its seats enabled Lufthansa to boost seating on its Airbus A320 fleet from 150 to 168, increasing its fleet's seating capacity by the equivalent of 12 new A320s. Budget carriers for the most part dispense with the upper classes, although there are exceptions. While a passenger sitting in a business or first class seat is a big revenue win for an airline, if that seat is empty it works the other way. Realistically, passengers with fat wallets aren't going to be flying with a budget airline anyway so they tend to dispense with premium classes in favour of a one-class plane, with lots of seats. This is one area that makes low-cost carriers salivate. At booking time you can nominate how much check-in baggage you'll be taking on board, and pay a fee. Human nature being what it is, there is a tendency to underestimate your baggage weight and pay a lower fee rather than playing it safe and going for a fatter allowance. Then you front up at the check-in desk, put your bags on the scales and the gotcha moment – you're busted. Excess baggage fees vary from airline to airline and might depend on your ticket class, but $15-20 for every kilogram over is fairly typical. Excess baggage fees are part of what's known as ancillary fees, and they're a big win for airlines. In the USA, ultra-low cost carrier Spirit Airlines makes over one third of its total revenue from ancillary fees. Seat-back entertainment systems are expensive to install, they're an ongoing cash leakage to an airline and they add weight, so see that cute child playing peek-a-boo with you over the seat back? That's your inflight entertainment. Big, glossy airports at major hubs make a lot of money for their owners. Part of their revenue comes from the landing fees from airlines. If a carrier can land at a cheaper airport that's a win to them, even if it's in the middle of nowhere with perhaps not so great shuttle services into the city. This is flexible price mechanism that airlines use to price tickets according to demand. Typically, prices will start off low and as flight time approaches and seats become less available the price rises. Leave your booking until the last minute and you might pay three times what the passenger in the next seat paid when they booked three months before. Low-cost carriers use dynamic pricing technology that allows them to squeeze maximum revenue out of their seats, and they're very good at it. Budget airlines operate mostly on popular routes with high demand where they can undercut full-service airlines operating the same route. Neither Jetstar nor Tigerair will fly you from Melbourne to Mildura. However they will sometimes sniff out a niche market. For example several budget carriers now operate out of San Francesco d'Assisi Airport in Italy's Perugia. Most of them head for the nearest major hub city, Rome but Ryanair flies direct to London since Perugia is a catchment for the many Brits who call this desirable part of Italy their second home. Instead of using airbridges to get passengers on and off their aircraft, budget carriers are more likely to park aircraft at remote stands, which is a cheaper option. If they can park their aircraft close to the terminal they might also dispense with the bus and passengers can look forward to an old-school disembarkation – the tarmac walk. It costs airlines big money to park at a shiny new terminal and if they can use their own purpose-built concrete block terminal with fewer toilets, fewer seats and lower space-per-passenger ratio, they will. Excuse me? You want what? Because you're flying with Stand Up and Save you've demonstrated that your loyalty is to your hip pocket. You chose us because we're cheaper than everyone else. As long as we stay that way you'll continue to fly with us. And if we give you loyalty points that's a cost to us which means higher prices so – whoops – you're now flying with another airline which doesn't give loyalty points but does give you a cheap seat so no, sorry, nix to the points.